It’s great that my son is now able to go to the movie theater. This provides an incredible excuse to go see all of the ‘kiddie’ films that actually look decent to me. Pirates! has been on my radar for quite some time because I absolutely love the studio behind it. The animation style is similar to those I grew up with, and the humor always works well for me. So I was excited to get the opportunity to go with my son and enjoy it together. I’m glad to say that I walked away from the film pretty pleased with it, though it wasn’t all that I hoped for either. Pirates! is a delightful little adventure, though I must say it seems to fall on the short side when it comes to story and length. Perhaps I went in expecting more than I should have, but to me, the story felt thinner than usual with Aardman films. The film follows Pirate Captain (and yes…that’s his name), who is probably one of the worst pirates around. Yet his crew loves him and he tries to prove himself to the other captains in order to win Pirate of the Year. This journey takes him plundering everything from plague ships to ghost ships, and eventually lands him on a scientific vessel. Hijinks ensue, the beloved bird gets stolen, and a valuable lesson is learned. All in all, your typical kid-movie stuff. It’s all very well done, though, don’t get me wrong, but when it comes to Aardman animation, I don’t really expect ‘typical’ to be in the equation. Don’t let that hold you back though, as this is still a very funny film. It’s got all the slapstick to keep the kiddos entertained and laughing throughout, yet it’s filled with jokes that an older audience will enjoy (and go right over the youngsters’ heads). Truthfully, there were many times during the film where I heard us parents laughing harder than the children in the audience. Oh and be sure to pay attention to the song that plays about ¾ of the way into the film…the lyrics are hilarious, it’s not just background noise. This is probably the best Hugh Grant film I’ve seen in a long time. 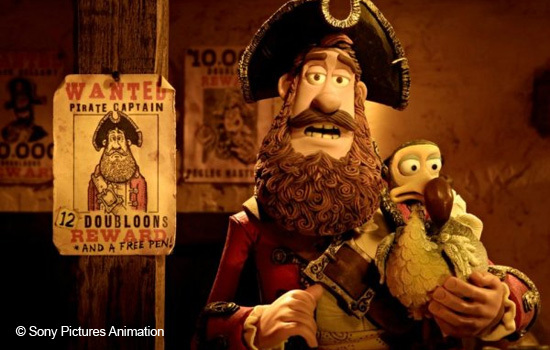 He plays the Pirate Captain masterfully and really the entire voice cast is superb. The animation style is quirky and loveable as always, and as I said, I left with a smile on my face. That’s partly why I was disappointed this adventure lasted barely 90 minutes. I would have loved to see more happen in this world they created and get to know even more of the characters. Overall, The Pirates! Band of Misfits is a movie that not only your child will enjoy, but you will as well. If you don’t have any kids, I think it’d still be worth seeing, but in that instance it would be more rental material. It’s a great excuse for an afternoon out with the kids, but if you’re looking for a great film on your own to see in theaters, this probably wouldn’t be my first choice. The Pirates! gets a 7 out of 10.